Beauty competition - WIN! An Elemis Pro-Collagen goodie bag! WIN! An Elemis Pro-Collagen goodie bag! When it comes to skincare, Elemis is our go-to brand – they really do have an answer for every skin complaint. We’re very excited to announce the upcoming launch of the Pro-Collagen Super System. The range includes Pro-Collagen Super Serum, Pro-Collagen Oxygenating Night Cream, Pro-Collagen Marine Cream and Pro-Collagen Quartz Lift Mask. All of which is clinically proven to reduce fine lines, wrinkle depth, and give smoother skin. Does that sound good to you? The Pro-Collagen Super System launches exclusively on QVC and it will be on air on Elemis’ Today’s Special Value show on Sunday 16th February. As QVC will be the first to have the system before it launches officially on shelves in April, they will be selling the system for £140 (instead of £155) until March. That’s a saving of £15, plus free P&P worth £5.95. To celebrate the launch, we’ve teamed up with Elemis to bring you a very special prize worth £172. One lucky winner will receive: Pro-Collagen Cleansing Balm, Pro-Collagen Eye Renewal and Pro-Collagen Lifting Treatment for Neck and Bust. Yep, you could say we’re spoiling you. Want to win? Simply send an email to womancompetitions@ipcmedia.com telling us which antioxidant the Pro-Collagen Super Serum contains (answer can be found in the ‘QVC’s best beauty bargains’ gallery, below). Your email also needs to include your full name, address and contact details using the subject line ‘Elemis Pro-Collagen’. The closing date for entries is Midnight Friday 28th February. Make sure you tune into QVC on Sunday 16th February. Show times for the Pro-Collagen Super System are: 12am, 11am, 4am, 2pm, 5pm, 8pm and 11pm. Love a bargain? Check out the other brilliant beauty deals you can get from QVC. Terms and conditions: Entry: Entry is open to residents of the UK, Channel Islands, Isle of Man and the Republic of Ireland, except employees (and their families) of IPC Media, its printers and agents, the suppliers of the prizes and any other companies associated with the competitions. The winner(s) must be aged 18 or over. Proof of identity and age may be required. Use of a false name or address will result in disqualification. Entries that are incomplete, illegible, or indecipherable will not be valid and deemed void. Only one entry per person is allowed. All entries must be submitted via email containing the person’s full name and contact details. The closing date for entries is Midnight Friday 28th February 2014. All entries must be made directly by the person entering the competition. Entries made online using methods generated by a script, macro or the use of automated devices will be void. Winner Selection: The marketing team of Woman will choose the winners at random on Monday 3rd March 2014 and has until Midnight on Tuesday 4th March 2014 to claim their prize. No correspondence will be entered into. The winners will be notified of their win via email. Reasonable efforts will be made to contact the winner. If the winner cannot be contacted, or is unable to comply with these terms and conditions, IPC reserves the right to offer the prize to another entrant, also chosen by the marketing team. Prizes: There is one prize to be won. 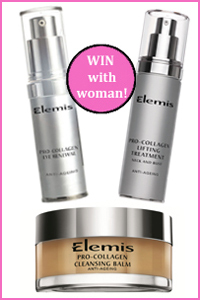 The prize is: Pro-Collagen Cleansing Balm, worth £39.50; Pro-Collagen Eye Renewal, worth £59.50; and Pro-Collagen Lifting Treatment for Neck and Bust, worth £73. The prizes are non-transferable. Standard IPC terms and conditions apply. By entering this competition you agree to comply with our terms and conditions of play.